The Lenkurt Company was a rapidly growing microwave and telephone communications systems concern, on the forefront of a new technology whose applications are now myriad today yet were only just beginning to evidence potential in 1955. Founder/owners Lennart Erickson and Kurt Appert (providing the Lenkurt firm name) desired to prepare a new production facility which would serve their needs as well as establishing a powerful international identity for their future services and products. Towards these ends they retained the services of Frank Lloyd Wright. The project first came through the office of Aaron Green, then serving as Wright's West Coast Representative in San Francisco. Wright appointed Aaron Green as Associate Architect for the project who then began working closely with the Lenkurt representatives for the next two years as an intermediary for interpreting program needs, marshalling the efforts of various consultants and cost estimating. 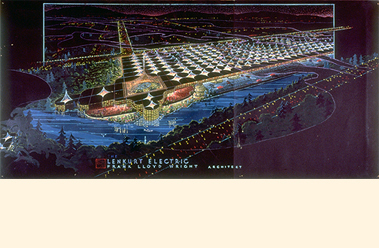 Frank Lloyd Wright designed a remarkably innovative and flexible scheme for a 200,000 square foot plant for a firm which would employ nearly 3,000 individuals. One of the more thoughtful strategies was in the disposition of parking. In a conventional industrial complex, a great sea of paved parking typically engulfs the plant buildings. However, at Lenkurt, the parking was entirely contained under the building. Parking represents the gound level, fully shaded and weather protected, with access to the workspace above via a series of stair/elevator entries. The main building is supported above the parking by a repeating pattern of tapered columns which, in turn, pass through the work spaces above and spread into a circular pad at the top to actually become the roof. It was based on a similar design used so success-fully at the Johnson Administration Building in Racine, Wisconsin some thiry years previous. For Lenkurt, in the opening formed between the meeting of four columns, Wright created a tent-like pyramidal skylight of glass with copper louvers which could be adjusted in order to control the daylighting. The building is constructed almost entirely of reinforced concrete. Since support for floors and roof were entirely carried by the columns, the exterior walls became screen-like, constructed of modular lightweight precast panels with glass-filled rectangular openings. A three-story open atrium pavilion was designed at one corner of the complex which would contain the cafeteria, auditorium, library, gallery, landscaped gardens and fountain pool--all under a immense sheltering skylight pyramid. Executive offices were on the balcony level of this pavilion overlooking the landscaped inner court and extending to private terraces at the building's exterior.